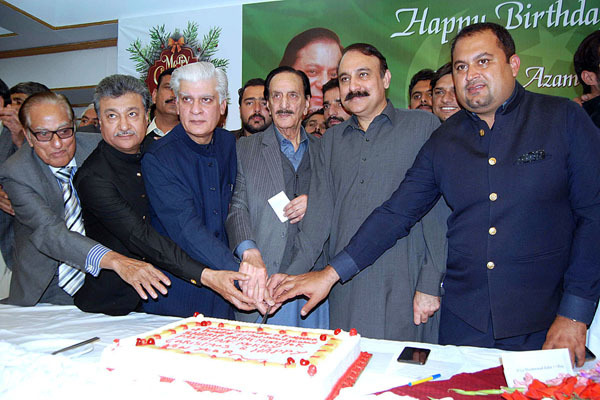 ISLAMABAD, Dec 25 (APP): Special Assistant to Prime Minister for Political Affairs Dr. Asif Kirmani celebrated birth anniversaries of father of the nation Quaid-e-Azam Muhammad Ali Jinnah and Prime Minister Muhammad Nawaz Sharif. He cut a 1000 pound cake here at National Press Club. The ceremony was attended by Pakistan Muslim League (N) former Member National Assembly Malik Shakil Awan, Deputy Mayor Islamabad Syed Zeeshan Ali Naqvi and other leaders of the party. PML-N leader and member National Assembly Abid Raza paid tribute to the services of father of the nation and prayed for the prosperity of the country besides long life of the Prime Minister. He also congratulated the Christian community on Christmas.